8/9/08 — Art Market — Paris, Eric Coatalem Gallery — The event is rather unusual : an exhibition of twenty-three drawings by Gustav Klimt, no doubt the leading artist of the Viennese Sezessionist movement, in a private gallery. Despite giving off an impression of unity, the works do not all have the same provenance. In fact, Eric Coatalem has been purchasing sheets by Klimt for several years in order to present this retrospective. 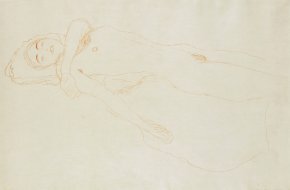 Thus, the gallery exhibits several feminine nudes, the genre for which the artist is best known, such as the beautiful Reclining Woman in red chalk (ill. 1). 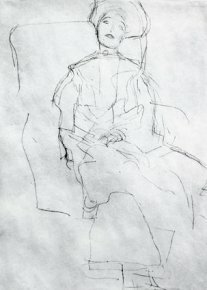 Another remarkable image is a study for an elderly seated woman, a preparation for an illustration in the magazine Ver Sacrum of January 1901. One can also discover several portraits, one of which is preparatory (ill. 2) for the Portrait of Adele Bloch-Bauer, Klimt’s mistress, acquired two years ago at record price by Ronald Lauder and now displayed at the Neu Museum in New York.